An obscure 1986 law continues to vex hospitals as they struggle to provide the on-call coverage for emergency rooms the law requires and elicit the support of physicians struggling with many of the same issues. The Stark law prohibits physicians from ordering designated health services for Medicare patients from entities with which the physician, or a family member, has a financial relationship unless an exception applies. This article reviews 11 key concepts under the Stark Law, in the context of changes to the Stark law made by CMS. Gerald Alexander, MD — Dr. Alexander is an orthopedic surgeon, specializing in disorders of the spine, who practices at Fullerton (Calif.) Orthopaedic Surgery and Fullerton Surgery Center. Dr. Alexander attended medical school and completed his orthopedic surgery residency at Loma Linda (Calif.) University. He completed a fellowship in spine surgery at UCLA Medical Center in Los Angeles. This letter offers a handful of observations one can make as this year starts to evolve. It discusses three papers which are available upon request. It also provides information about 27 of the 68 sessions and discounts for our June Orthopedic, Spine and Pain Management Driven ASC Conference. Here are the average annual salaries for spine surgeons by region, according to the 2008 Physician Compensation Survey conducted by the American Medical Group Association. Whenever someone asks me what it takes to succeed in the ASC business, I immediately tell them about “the five C’s.” These are the five core concepts or competencies that must be mastered by physician-owners at all types of ASCs, in every region, if they are to prosper. Here are statistics on the 2008 cash compensation earned by orthopedic surgeons, as compared by region, according to the Integrated Healthcare Strategies 2008 Healthcare Executive Compensation Survey and supplementary IHS statistics. 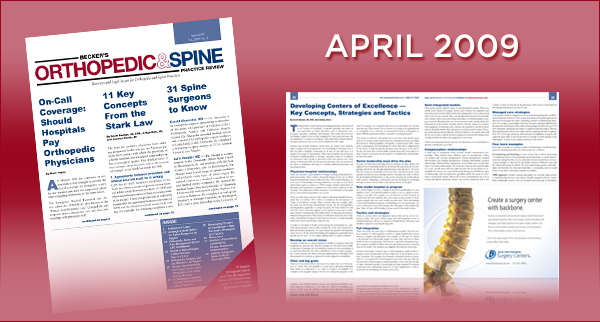 This article focuses on current events and risks in the growing orthopedic and spine devicemaker industry.1 Orthopedic and spine procedures can be very profitable for surgery centers, as confirmed by the increasing number of centers performing these procedures. Reimbursement is solid for orthopedic procedures, and demand for implants is increasing as the Baby Boomer generation is aging. More implant and spine cases are being performed at ambulatory surgery centers than ever before. The current struggling economy has impacted many industries, including orthopedic and spine practices. As a result, many practices are facing challenges to remain profitable and efficient. Here are five major challenges identified by industry experts that orthopedic and spine practices may face in this economy. The importance of developing outstanding programs, often referred to as “Centers of Excellence,” in specific specialties has taken on new importance in critical specialties such as orthopedics, neurosurgery and spine, cardiology and oncology. This article discusses how developing a grand vision or plan comprised of clear goals can guide the development of a Center of Excellence. This article then examines specific strategies and tactics that can be used to implement such a plan. Hospital executives leading nationally recognized superior programs offer a variety of tips for achieving those coveted designations, but they all sound like variations on the answer to that old Broadway joke: How do you get to Carnegie Hall? Practice. Practice. Practice. About one year ago, my partners and I decided to add spine cases to our outpatient surgery center, the East Portland Surgical Center (EPSC). It was a big decision, with important clinical and operational implications, so we thoroughly assessed the risks and opportunities before moving forward. I’m pleased to report that our decision has worked out very well.